Animation is becoming increasingly popular as a medium, widely used for both entertainment and promotional video it is appealing and engaging to people of all ages. As such, the need for animation from with After Effects is growing, so here we will look at how the basic aspects can be achieved. If you want to edit professional videos easily, we highly recommend using Wondershare FilmoraPro, which is a powerful editor for pros and semi-pros. You can use keyframes to make soomth animation with step by step tutorials. Value graph will give you more controls on adjusting keyframes. You can also make effects and animated text easily. Download it now to have a try (free)! 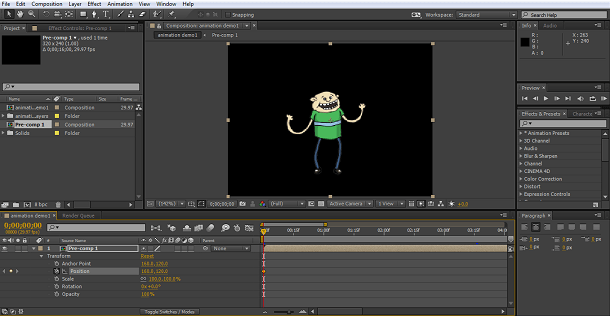 Perhaps more than any other aspect of After Effects capabilities, successfully animating a character is very dependent on the original file for the character you are working with. For animation within After Effects, you need a specific type of character file, where each piece of the character you want to animate is a separate layer. These are mostly created in Illustrator, however if you do not have Illustrator or lack the ability to draw your own character there are free ones available on the web to use for you to practice this technique. You just need a character that has each distinct part separated into individual layers. Importing the character file is the same as any other, you can simply drag the file onto the project panel to begin the file import dialogue. It is important to select the right format here to ensure that the different layers are retained so you can animate it. In the import dialogue ‘Footage' is usually the default import type, and this should be altered to Composition – Retain layer size, as this keeps the layers and at the same time keeps each layer bounding box to the size of the element itself. And there you have your character and its associated layers in your project panel. Double-clicking the now imported composition for your character sets up the project for you, now we have to make sure it is all the correct size for your requirements. Now, if you want your character a little larger or smaller, you would expect to just select all the layers and adjust the size of them all simultaneously, however with linked layers like this, it has the effect of pulling the layers apart as they shrink or overlapping as they grow, so you need to create a new Null Object from Layers>New>Null Object, and then parent all the other layers to it. You do this by selecting all the layers and dragging the parenting button to the null object. This is the most effective way of scaling any multilayered object and is useful beyond the animation project being discussed here. Once you adjust your character and get everything as you want it, we can move on to the basics of animating your character. After adjusting the resolution and character to fit I have the following as my work screen. To keep things simple, I am going to restrict my animation to a couple of limbs, we will be using a combination of After Effect's Puppet Tool and Parenting to achieve this, so the first job is the puppet tool itself. You find this on the top menu bar, and this tool is designed to put a pin in a layer where you want it to track movement. How you use it is to select the layer you want, select the puppet tool, and put a pin in the places you that are key points you want to track, it is these points After Effects uses to interpret the movement between keyframes. Here I'm placing pins at strategic places around the character, you simply click on the place you wish to put a pin with the puppet tool active. 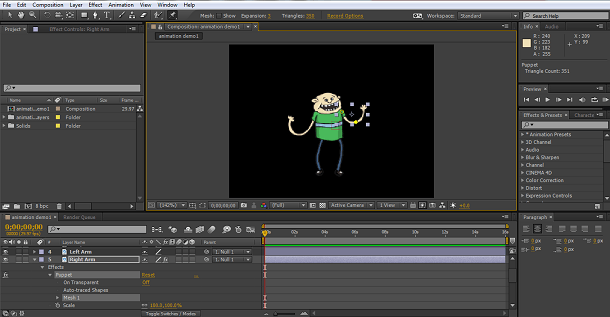 Once this is done you can then begin to animate the pieces. This is done by selecting the layer or layers you want to move, and go through the timeline panel to get to the effect, and finally creating movement in the scene as the last stage. 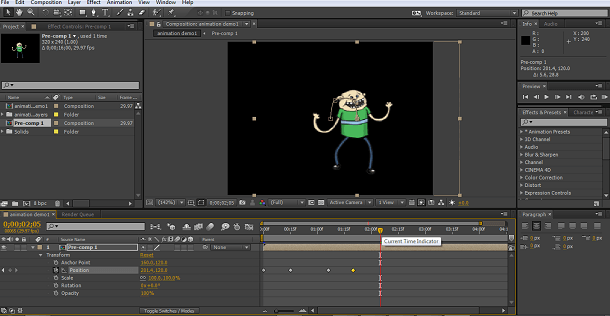 To get the animation working we, as with most after effects projects, use the keyframe concept. Here we go to the timeline panel and select the specific layer we are working on, here it is the left leg. We expand the attributes for the layer, and go through puppet>Mesh>Deform to get to the pins we placed earlier. Shift select all the pins in the layer, in this case there were 3, and set the first keyframe. 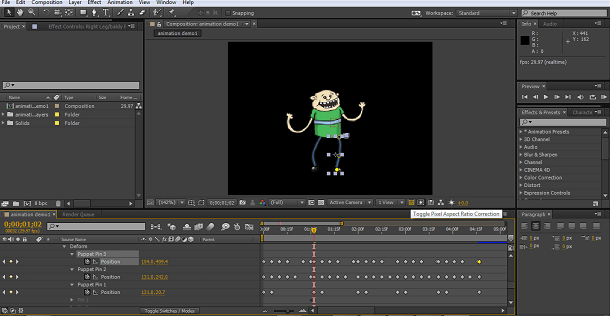 Then move the timeline along a few frames, adjust the leg, set the next keyframe. I like to aim for 5 keyframes in a complete sequence of movement, and I can then cope and pastes those keyframes to repeat the sequence if needed, for things such as walking, it speeds up the whole process. These adjustments are repeated every five frames until we have the first leg animated for a complete movement. 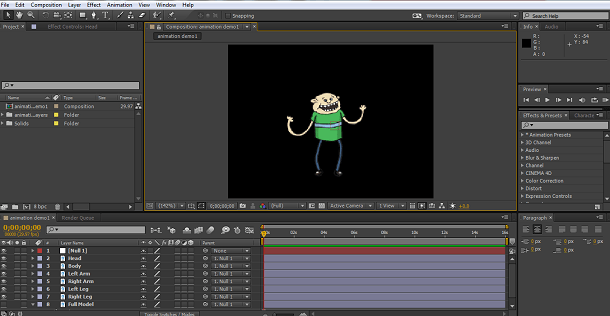 I then simply copy and pasted those keyframes 3 times down the timeline to create a four step sequence. The next step is to repeat this with the other leg. With this one you have a guide because as you advance the time cursor your previous animation will show, so you can match the second movement to this. Here we have movement to simulate a little dance, you can of course, now move on and add head, body and arm movements to go with it, but for simplicity here we will just do the legs. Once we have our sequence with the animation we want, the next step is to add some actual movement to the scene. The best way to do this is to pre-compose the entire sequence you just created. 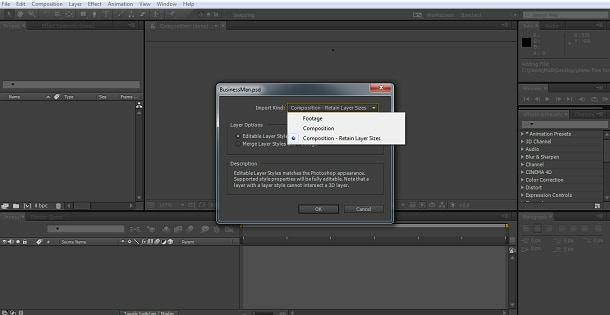 Select all the layers and select Pre Comp from Layers>Pre Comp, this creates your animation sequence in a single composition that we can then adjust without effecting our animated pieces. As ever, movement starts with creating a keyframe at the timeline start for the position of the pre comp. If you were doing a walking animation your start position could be off the screen to simulate movement onto the screen and off the other side, In this little example we are going to simulate the up and down movement of a dance. Then it is simply a matter of more keyframes and resetting the position each time. This is obviously a very basic animation with a little foot tapping flourish at the end, but the principal of animating your characters remains the same whatever it is you are doing. The key is to be methodical in the movement setting, once you have one limb adjusted, you can use that as a guide to the rest and work through each one until the sequence is complete for all components of the character. Also remember you can go back to each keyframe on any component of the character and make alterations until you are happy with the results. If you are new to animation can be a bit of a trial and error process, but perseverance is all that is needed. It is also really essential to make good use of the copy and paste facility to reproduce your walking, dancing or whatever movements to save a vast amount of time in the process. If you want to have more controls on making animation and effects, download FilmoraPro to have a try (free)!